Fiona’s love and interest in textiles and print stems from attending several higher education courses at Amersham & Wycombe College in the late 90s. During her time there, Fiona learnt and experimented with screen printing, litho printing, block printing, machine embroidery, dressmaking and fashion. She gained 2 GNVQs in Art, an HND in Graphic Design and a degree in Applied Graphic Studies during her 5 years at the college. Unfortunately after graduation, Fiona’s creativity had to sit on the back burner for a while, whilst she worked in Office Management and Logistics. Several years later, she finally started work with a local Graphic Design and Marketing company, and once again the creative juices began to flow. A one day felt making course at Queens Park Arts Centre in Aylesbury, grabbed Fiona’s imagination and creativity like nothing else, and she’s been totally addicted ever since! Still a Graphic Designer by trade, Fiona loves the “hands on” approach to creating textile art, and in particular making felt. Fiona indulges in the freedom and creativity that felt making gives, and the uncontrolled outcomes due to the friction applied to the fibres. Making felt by hand is physically demanding, meaning that a single piece can take 40 hours plus to complete. 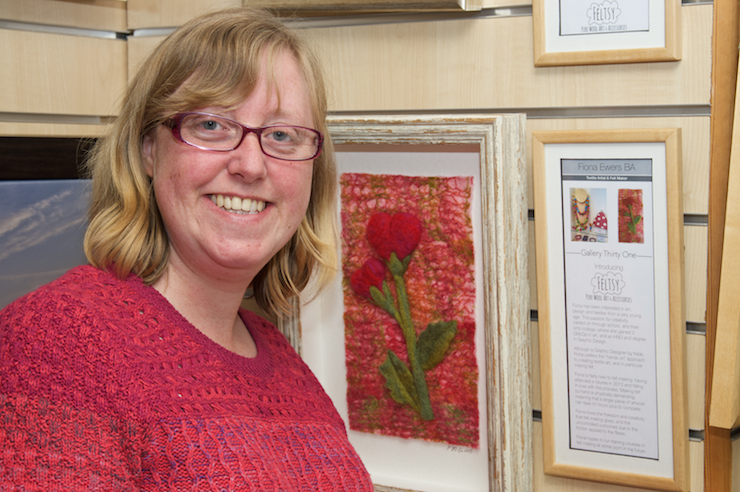 Fiona spends much of her spare time planning and making felt artworks, felt beads (to be later used in jewellery and other accessories), flat felt decorations and purses. She hopes to extend her range to include clothing, pods (seamless felt vessels) and hats in the near future. Fiona also loves to knit and sew, and will one day incorporate all 3 techniques to produce upcycled items. Fiona also creates limited edition lino prints, using the reduction method. “It is wonderful to create a beautiful design only a few times, knowing that it can never be recreated the same again, almost like a withering flower that cannot be revived”. These prints are also available to purchase in the gallery.